Armwood Editorial And Opinion Blog: It is time we tell the truth about those who support and those who voted for Trump. These were not innocent or good people. 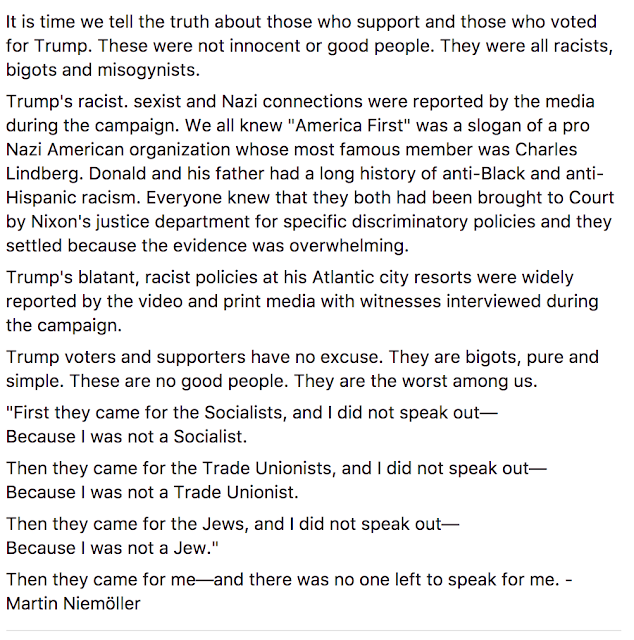 They were all racists, bigots and misogynists. Trump's racist. sexist and Nazi connections were reported by the media during the campaign. We all knew "America First" was a slogan of a pro Nazi American organization whose most famous member was Charles Lindberg. Donald and his father had a long history of anti-Black and anti-Hispanic racism. Everyone knew that they both had been brought to Court by Nixon's justice department for specific discriminatory policies and they settled because the evidence was overwhelming. Trump's blatant, racist policies at his Atlantic city resorts were widely reported by the video and print media with witnesses interviewed during the campaign. Trump voters and supporters have no excuse. They are bigots, pure and simple. These are not good people. They are the worst among us. 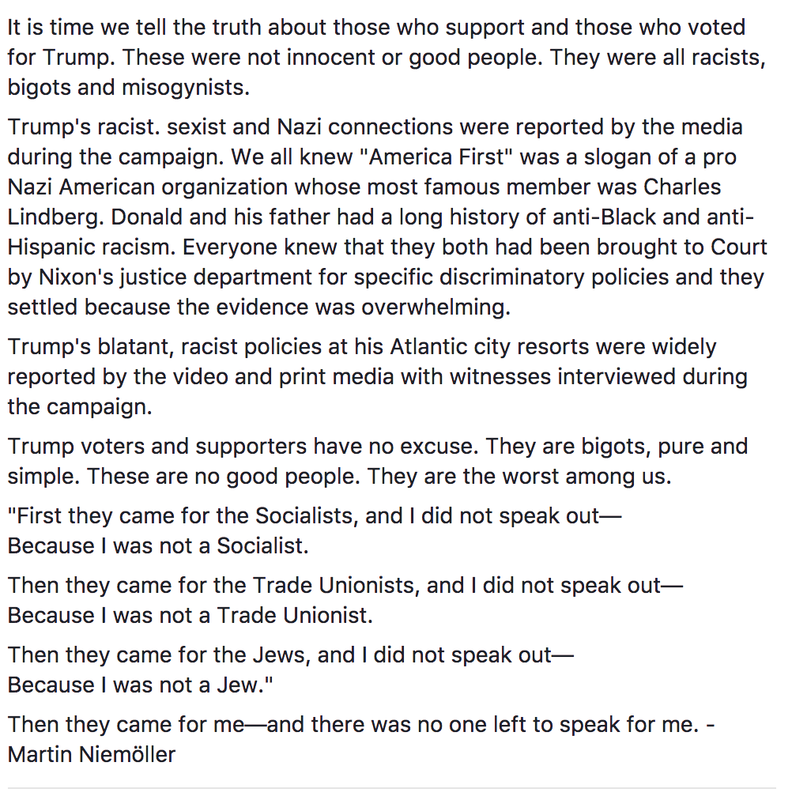 It is time we tell the truth about those who support and those who voted for Trump. These were not innocent or good people. They were all racists, bigots and misogynists. Trump's racist. sexist and Nazi connections were reported by the media during the campaign. We all knew "America First" was a slogan of a pro Nazi American organization whose most famous member was Charles Lindberg. Donald and his father had a long history of anti-Black and anti-Hispanic racism. Everyone knew that they both had been brought to Court by Nixon's justice department for specific discriminatory policies and they settled because the evidence was overwhelming. Trump's blatant, racist policies at his Atlantic city resorts were widely reported by the video and print media with witnesses interviewed during the campaign. Trump voters and supporters have no excuse. They are bigots, pure and simple. These are not good people. They are the worst among us.